While silicone rubber plugs are typically reserved for high temperature paint masking applications, the EPDM rubber plugs are inexpensive rubber hole plugs that can be used for a wide variety of applications. They can resist very high temperatures, up to 600º F while maintaining their pliable, conforming nature. Rubber caps and plugs resistant to harsh chemicals. They are ideal to be used in anodizing and plating. Rubber caps and plugs are excellent for any application requiring a durable closure that can provide a very tight seal. The material also functions well as a noise insulator or inhibitor. Rubber Flange Caps: This is a type of cap or plug, the design of which simplifies the application and removal of the cap. There is an internal lip on the open end that provides a positive seal to prevent any contaminants from seeping onto the part. A flanged head enables the cap or the plug to be manually removed with ease. Plus Plugs: The plus rubber plugs, with their unique 360° pull tab design, are easy to install. 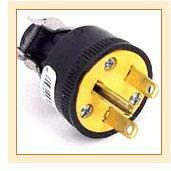 T-Plugs: The T-plugs come in a wide variety of sizes and offer a cost effective solution for many applications. Side Pull Plugs: These are rubber T-plugs with pull tabs. Electrical Connector Plugs: This is another rubber plug designed specifically for electrical connectors. Threaded Plugs: Threaded plugs are rubber plugs with screw hole designed for use on flared fittings. Pull Plugs: They are rubber plugs used for sealing both ends of a through hole. Washer Plugs: These not only act as rubber hole plugs, but also mask the area surrounding the hole. Although vinyl is technically a plastic material, many people refer to vinyl plugs as rubber caps or rubber plugs. In many ways, both vinyl and rubber are very similar. Both provide airtight seals and extremely flexible. They insulate. They also provide a significant level of cushion to the product that they are protecting. However, vinyl materials cannot resist the high temperature used in many powder coating curing process which is not the case in rubber materials. High temperature resistant vinyl plugs or caps perform admirably in most paint curing systems. Vinyl and rubber closures come in a wide variety of vibrant colors, shapes and sixes.